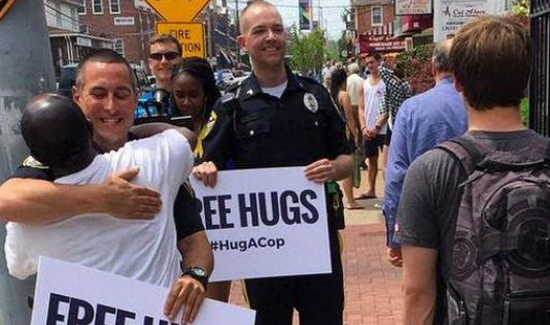 What happens when two NPD officers walk down the street with signs that read “Free Hugs”? Oh, just one of the biggest viral videos of the year (so far). The video above was posted by the Newark, Delaware, Police Department on its Facebook page, and in less than two months, it has racked up more than 7 million views and more than 150,000 shares (and that’s not counting the scattered thousands here and there from other reposts and excerpts). Many thanked the police or recalled good experiences with them, but not not everyone loved the idea. But Newark police Cpl. James Spadola, who is one of the huggable cops in the video, and others in the Newark Police Department are pleased with the public response. That includes police agencies near and far copying the idea. “The farthest away was Rio de Janeiro,” Spadola said, adding there may be others that they haven’t heard about. So, are you ready to hit your beat with arms wide open? Sound off in the Comments section below.